Acqua di Parma celebrates the artisanship of Italy in a collection of iconic fragrance and skincare. The stately and historic Acqua di Parma brand has offered niche perfumery since 1916. 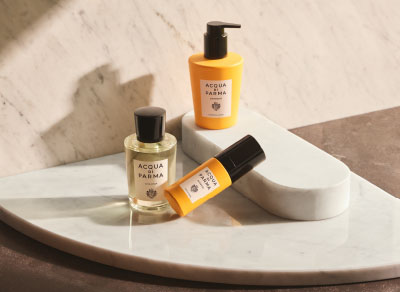 That same year the iconic Acqua di Parma Colonia scent was created; its light and fresh fragrance so far removed from fragrance on offer at the time that it quickly became a cult product. Today, Acqua di Parma still operates with the same values of refinement, quality and tradition, and is exclusively produced in Italy. Acqua di Parma is a brand for connoisseurs and those with an appreciation for timeless classics. Each collection exhibits a true taste of Italian elegance. From stars to politicians to public figures, Acqua di Parma has maintained a notable place in the affections of opinion leaders. Its fans have included Humphrey Bogart, Cary Grant and Ava Gardner - some prestige company indeed. From the Home Fragrance Collection to the Collezione Barbiere, from Colonia to the Blu Mediterraneo fragrances, each facet in the ever-evolving tale of Acqua di Parma continues to speak of its elegance and historic charm. The Acqua di Parma collection is characterised by its indulgence and Italian savoir-vivre; a way of life that will no doubt endure for another 100 years.